From the state’s No. 1 walkable meeting location with 12 event spaces to a campus resource with two auditoriums and six banquet rooms, Manhattan has highly abundant capacity to entertain large annual conferences or small quarterly office getaways and leave attendees thirsting for more. Two ballroom spaces accommodate 1,000 guests each among Manhattan meeting places. 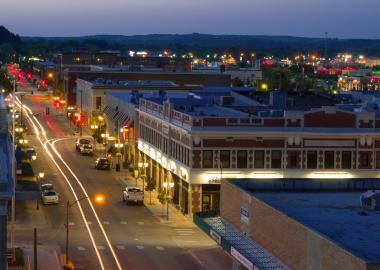 The Gateway to the Flint Hills entices visitors with diverse menu offerings at unique venues in Downtown Manhattan, Aggieville and Westloop shopping areas. Blue Earth Plaza and City Park are two green spaces located near Manhattan meeting places, and Flint Hills Discovery Center offers an educational experience adjacent to Manhattan Conference Center. The ultimate green space exists in the Flint Hills, where visitors escape for amazing horizon views and other-worldly sunsets. Consider Manhattan for your next meeting – Oh, Manhattan? – and then exceed all of your meeting success levels: “Oh, Manhattan! Click here for more meeting planner information in Manhattan.